On Server 2008 and 2008 R2, if your Domain Controllers arenâ€™t configured to require LDAP signing and disallow simple LDAP binds in plaintext, Active Directory Domain Services logs a warning event on startup, and summary events every 24 hours. This entry was posted in Posts, worklog and tagged ActiveDirectory, data, LDAP, PowerShell on November 3, 2010 by Geoff. Iâ€™ve been working on deploying a load-balanced Remote Desktop Gateway service. I deployed the first farm member, then cloned it to create a second member. 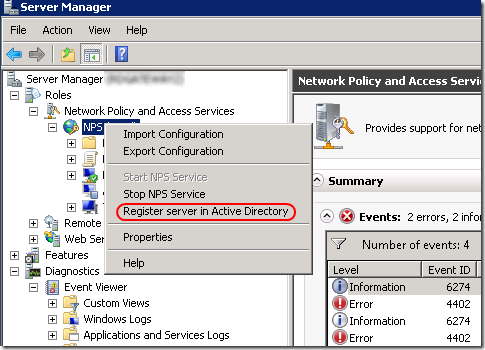 The second member was throwing Error events, which has the description "There is no domain controller available for domain CAMPUS." 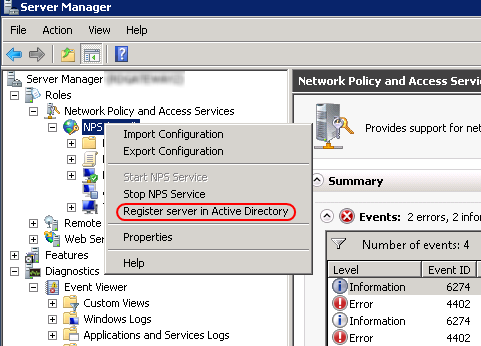 When I selected Register server in Active Directory, I received an error because the account I was using didnâ€™t have rights to modify the the AD objects. And that explains why this system as having the problem: when I joined the cloned system to the domain, I was not using a domain admin account. This entry was posted in Posts and tagged ActiveDirectory, rdp, Troubleshooting on September 17, 2010 by Geoff. Iâ€™m in the process of deploying a couple new Server 2008 R2 domain controllers. Iâ€™m using two IBM blades, each having a pair of Broadcom NICs that I configured in fault-tolerance teams. 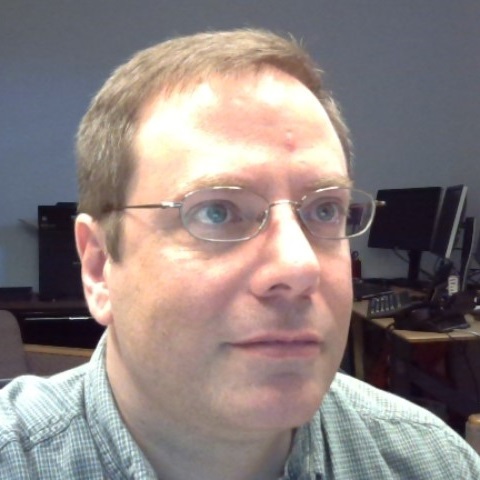 This entry was posted in Posts and tagged ActiveDirectory, Server2008, Troubleshooting on May 26, 2010 by Geoff. 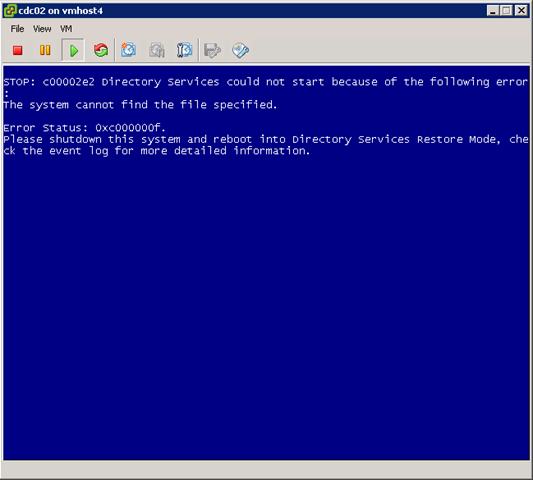 During an upgrade of our VMware ESX infrastructure, I ran into an issue with our domain controllers. As part of the process we needed to upgrade the virtual hardware that is part of the guest vm. After updating the domain controller guestâ€™s VMware Tools software, I shut down the guest and select Upgrade virtual hardware. Things looked good, so then I powered on the guest and it started to boot. After a moment, it threw a quick bluescreen and auto-rebooted. I booted to the Windows 2008 install media, and ran regedit from the recovery environment. I loaded the HKLM hive, and set the HKLM\SYSTEM\CurrentControlSet\Control\CrashControl\AutoReboot DWORD value to 0 (zero). I see in the KB 307973 article that thereâ€™s also a wmic command that will set the option. I donâ€™t know if wmic is available in the WinPE recovery mode. 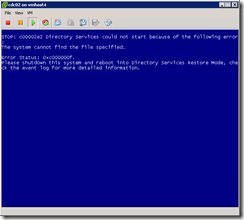 This entry was posted in Posts and tagged ActiveDirectory, Troubleshooting, VMware on February 17, 2010 by Geoff. Working on the Server 2008 hard limit of 5000 attribute values max per query, which breaks our Identity Management process. Iâ€™m looking at having to write a clone of LDIFDE that can issue queries using Range Retrieval and then synthesizes a single LDIF entry for groups with more than 5000 members. Safari Tech Books online provides some good resources, including The .NET Developerâ€™s Guide to Directory Services Programming [at Amazon], which provides a good code example in Listing 6.8. Range Retrieval Using DirectorySearcher. This entry was posted in worklog and tagged .NET, ActiveDirectory, C#, Programming on July 27, 2009 by Geoff. Itâ€™s June! Cold and rainy?! Gah!! Post regarding installing hotfixes on the Management Server using SetupUpdateOM.exe. Never heard of it before. Doesnâ€™t exist on my system. Perhaps itâ€™s part of OPs Mgr 2007 R2? After renaming the original 64-bit OOMADs.msi files and replacing them (AMD64 and IA64 versions) with the ones from the hotfix. Then I used the OpsMgr console to uninstall the agent from my four Windows server 2008 AMD64 domain controllers, one at a time. For each I verified that the new AD MP Helper Object was installed, checking appwiz and Program Files\Common. Then I checked the Operations Manager Event Log. This time, there were no errors running the DSDiscovery script. Health explorer on each DC is now clean. Yes!!! The only lingering issue is the presence of five errors in the event logs on each DC, complaining about the inability to locate Performance Counters for DirectoryServices: â€œDS Search sub-operations/secâ€, â€œLDAP Client Sessionsâ€, â€œLDAP Searches/secâ€, â€œLDAP UDP operations/secâ€, and â€œLDAP Writes/secâ€. I verified that I could see these counters within Performance Monitor on the DC. This thread in the OpsMgr Management Pack newsgroup seems germane, though the Live login isnâ€™t working for me at the moment. Managed to chime in on that thread. Weâ€™ll see if anything useful comes of it. This entry was posted in worklog and tagged ActiveDirectory, opsmgr, WindowsServer on June 1, 2009 by Geoff. This led me to a blog post suggesting that the AD Helper Object needed to be installed. So I look in the OpsMgr hostâ€™s AgentManagement location and find the msi. When I tried to install that msi package, I received an error that the â€œthis installation package is not supported by this processor type.â€ The host is running AMD64 Windows, and the file came from the AMD64 part of the AgentManagement tree. I checked the list of installed apps on another x64 DC, and saw that the â€œSystem CenterManagement Pack Helper Objectsâ€ item had been installed. So I tried repairing the agent install from within Ops Manager. Error persists. Now this KB article describes a set of circumstances that donâ€™t match my situation. I didnâ€™t install MOM 2005 agent and then the OpsMgr 2007 agent on the same host. This system was built from the ground up with server 2008 x64 and Operations Manager 2007 was deployed here way before server 2008. However, the constellation of symptoms and architecture issues make it sound interesting. This entry was posted in worklog and tagged ActiveDirectory, opsmgr, WindowsServer on May 29, 2009 by Geoff. This entry was posted in Posts and tagged ActiveDirectory on August 19, 2008 by Geoff.